Mobile Capture Provides a flexible, easy to integrate, and accurate automatic mobile capture solution. ABBYY's invoice processing solution enables companies to automatically handle incoming invoices and covers all necessary steps of the AP department - ranging from invoice data extraction to validation, release and the final booking of all invoice amounts in the ERP system. Capture invoices automatically at points of arrival, regardless of their format or medium. Have them queued for processing immediately with full visibility for your AP staff. Reduce manual data entry, eliminate redundant operations, and avoid costly human mistakes with automated data capture and validation. Take full advantage of early payment discounts. Empower your approval workflow with the intelligence of captured invoice data and route invoices to the right approvers automatically. Eliminate the problem of misplaced, mishandled or forgotten invoices. Optimize invoice capture with minimal investment and disruption to your established AP practices. ABBYY feeds your existing ERP, workflow or business intelligence tools with data, making them more informative and useful. See key data identified and extracted by ABBYY FlexiCapture for Invoices: click on any of the empty fields, to get its value, or click on “EXTRACT DATA” to capture all of the fields. Download Levvel Research's white paper to learn how automating invoice management and accounts payable processes can create a competitive advantage. How many best-practice AP processes does your company follow? See how to achieve the benefits of faster processing time, improved supplier relations, and reduced errors in your AP—no matter what size organization. As transaction volume grows, you may have found that your invoice management and AP systems can’t keep up. 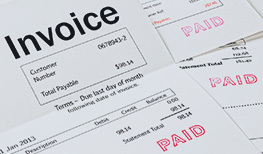 Learn best practices to automate your invoice processing. PepsiCo looked for a solution to eliminate the time and labour-intensive job of keying invoice and credit data into SAP manually. By automating the entry of invoice data into Sage 100, Wildman significantly reduced processing times and accelerated approvals. US-based PAPCO reduced invoice-processing times by 6 man-hours a day, saving $30,000 annually, and streamlined approval process.. Learn more about ABBYY products that power ABBYY’s Accounts Payable solution. It enables early capture of invoices, automatically reads invoice data and validates the data against your lists of suppliers and purchase orders. Find out how ABBYY Invoice Capture addresses your organization needs.